Baking pizza is one of my favorite pastimes, and that is precisely because it is so tough to get real Italian pizza with its authentic pizza taste outside of Italy. In the US, pizzas are usually overloaded with cheese, sausages and other fatty crap. In Europe, pizzas are made by anyone who looks Italian but isn’t, and they typically have no clue either. So in search of the perfect pizza recipe, it took years until I found the one that perfectly works in my home kitchen. As my personal god of pizza, Mario Batali, says: The most critical part of the pizza is the bread. Pizza dough is everything. If you get the bread right – not only the dough, but also how you bake the pizza – you have done 90% of the job. The rest is mainly taking care that you don’t screw it up. How do people screw up pizzas? Next to not having a thin, crispy dough with blackened edges and bottom, it is mainly because people overload pizzas with crap that doesn’t belong there. Real Italian pizza has very light topping, maybe a few pieces of Mozzarella Cheese on the plain tomato sauce, and perhaps some (!) ham. Ask any Italian, and they will tell you that the best pizza for them is Pizza Margherita. The most simple pizza you could imagine, it just consists of plain crushed San Marzano tomatoes, a bit of real mozzarella, and leaves of fresh basil on top after it is baked. Maybe a hint of olive oil on top. The simplicity brings out all the rich flavors of the individual ingredients, such as the crispness and smokiness of the bread, the tangy and sweet tomatoes, creamy-milky mozzarella and the sharpness of the basil. There is no need for more, period. And that’s why when I bake pizza, I exclusively do Margheritas. For the dough, mix 1 1/4 cup of hot water (100-102 F, or around 38 Celsius) with a pack of dry yeast and 1 1/2 tsp of sugar. Let it sit for a few minutes until the yeast starts to bubble. This step is the most important of all! In a large bowl, mix 3 1/2 cups of flour (best is Italian Tipo “00” flour) with 2 tbsp salt. Add the water when it’s bubbling, and mix to a smooth dough. Fold and press a few times, then form a ball adding tension to the top and place it seam down into the oiled bowl. Cover and let sit for one hour. After the hour, the mass should have doubled in size. Press down to eject the air, and cut into 10 equal pieces. Form balls again, adding tension to one side and place them seam down on an oiled baking sheet. Cover for 15 minutes. For the tomato sauce, I like to use canned whole San Marzano tomatoes from Italy. Crush the tomatoes and use together with the juice. Just add salt and a bit of pepper, nothing else. In the meantime, prepare the oven and a cast iron skillet. Heat up the grill of the oven, and heat up the skillet on the stove to maximum heat. Now start preparing the first pizza. 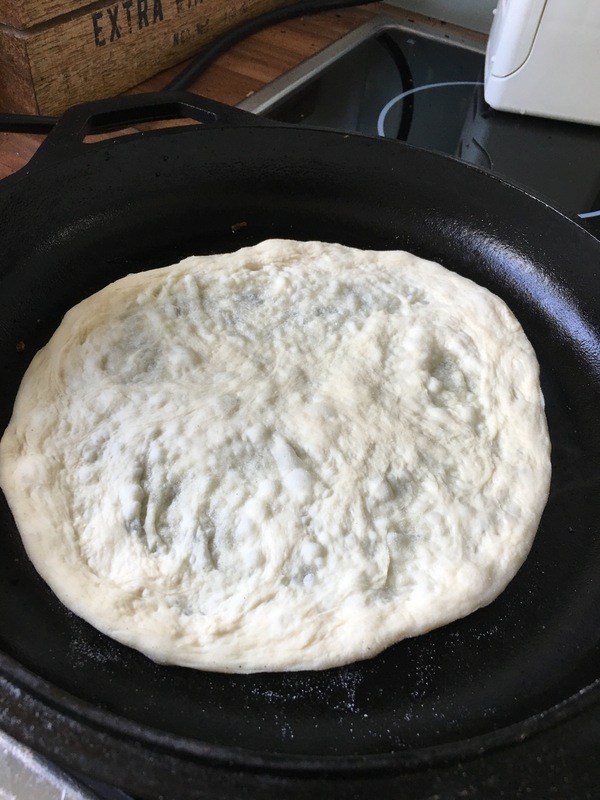 Slowly push flat the ball of pizza dough, and work your way to flatten and stretch the dough. You need to work slowly, so it doesn’t break. The dough needs to be so thin you almost can see through. 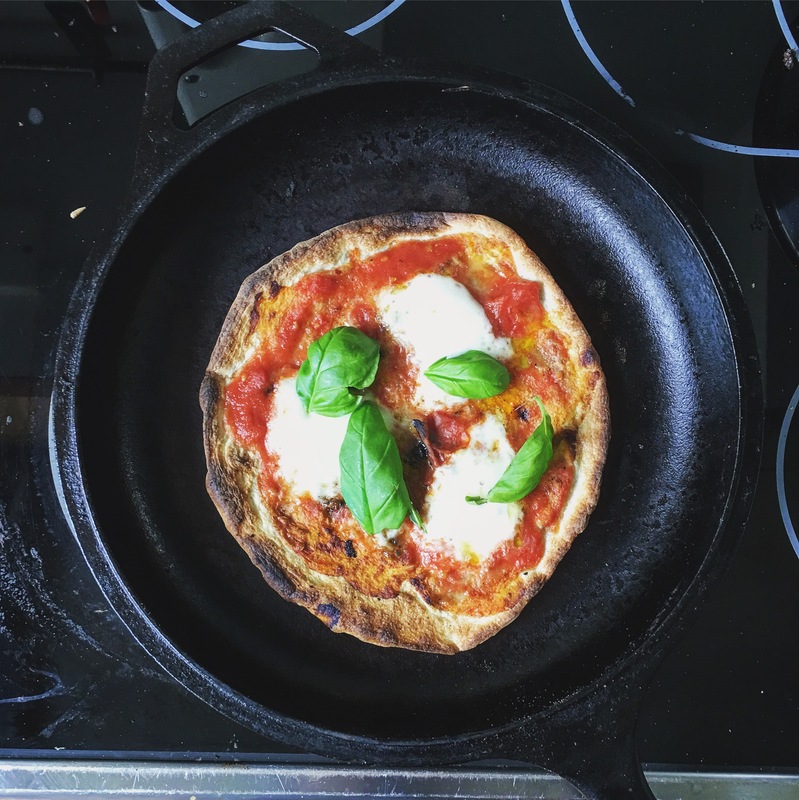 When you have reached the size of the inside of the skillet, place the pizza in the hot skillet. Within seconds the pizza dough forms bubbles, and soon smoke will arise from the bottom. It’s time to turn the pizza bottoms up and start adding tomato sauce and tiny bits of mozzarella on the crispy top. Be fast, so the bottom doesn’t blacken too much, and transfer the skillet to the oven grill. Bake for a minute or two, until the cheese makes bubbles and the outer crust is browning a bit and is crispy. Take out and immediately serve, sprinkle fresh basil leaves on top and maybe a bit of olive oil. My first step is to go get a cast iron skillet. I’m excited to make a pizza this way.